Born in Montreal, childhood norms for Jennifer included ice-skating on ponds, apple picking in the Eastern Townships, cross-country skiing and visiting sugar shacks to enjoy maple syrup taffy off of fresh snow! A 6 month trip in Asia sparked her desire to major in Tourism, and since college she has worked in the hospitality industry in a variety of capacities including, hotels & restaurants, travel agencies, destination conference planning and for the Vancouver Canucks. Fun Fact: Jennifer lived in the Caribbean for 3 years! Montreal, the 'joie de vivre' of Canada. Electric and alive, there's a charge in the air. It's like Europe and New York all in one place. It's fashionable and fast paced, you'll discover the French way: to set trends, live and enjoy life to the fullest. Open air cafes are a great place to sit and people watch or just soak in the rich culture and old buildings. Lounges, bars, and restaurants are open until the wee hours, and there are countless old historical churches and cobble stone streets to explore. I've never been interested in Cowboys or the Wild Wild West, but experiencing the Calgary Stampede Centennial turned me into a fan! For 10 days every July Calgary is buzzing with energy. From world-class entertainers and a vibrant nightlife to the fantastic midway carnival and art exhibitions - there's activities for every age and interest. Who knew that dancing in cowboy boots would be so much fun? Tell us about a special discovery you've made in Canada. White sandy beaches do exist in Canada! One place you'll find them is on Hornby Island, located on central Vancouver Island. This is a magical getaway spot, comparable to the beauty and serenity of Tofino, but even smaller - time seems to stands still on Hornby Island. 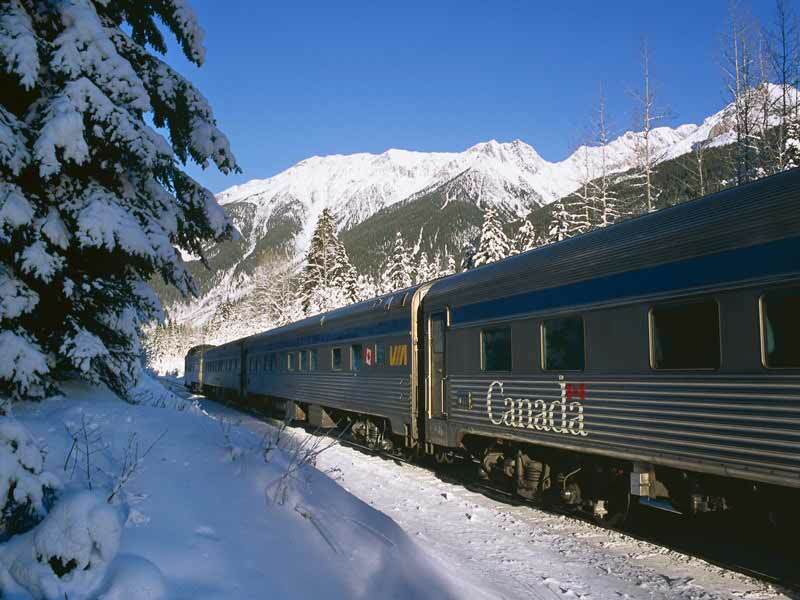 Canadian Winter Rail Tours Highlights: Vancouver | Via Rail Train | Jasper | Lake Louise | Banff | Calgary | Travel through the impressive winter scenery of Banff & Jasper National Parks as well as the majestic Lake Louise. With attentive services aboard Via Rail, you can relax and enjoy this inspiring journey.